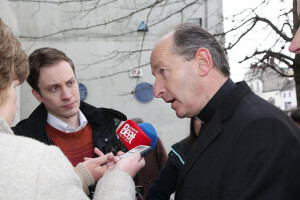 The Bishop of Waterford & Lismore has appealed to people to unite behind pro-life healthcare professionals opposed to the introduction of abortion. Bishop Phonsie Cullinan said he was calling on “all people of goodwill” to support doctors, nurses and midwives in their stand against an “unjust law”. Speaking to CatholicIreland.net, Dr Cullinan questioned why Ireland did not follow New Zealand’s example, in which healthcare professionals opt in to the provision of abortion if they wish and conscientious objectors are not obliged to refer their patients to others for abortion. He said the new abortion law which came into effect on 1 January had “no moral force”. “Catholics and people who hold that all human life is sacred from the first moment of conception have no obligation whatsoever to obey this law. “People of goodwill must support the right of hundreds of doctors, nurses and midwives, pharmacists and other healthcare workers not only to refuse to perform abortions, but they must not be required to refer their patients to another who will terminate life,” Bishop Cullinan said. His views echo those of Archbishop Eamon Martin, who spoke to the Irish Independent about the issue of conscientious objection before Christmas. He said this matter was of great concern to many people in Ireland. Archbishop Martin acknowledged that the majority of voters in May’s referendum on the Eighth Amendment were willing to allow abortion. But there was also a large number of people who wanted no part in it, and felt it was completely against what they stand for, he said. Dr Martin said many of the amendments that were proposed during the legislative process were trying to address concerns people had that abortion would be used for disability, race or gender. “Many people believe, and have good scientific reasons to believe, that pain relief should be provided particularly in later term abortions. Many people who voted in the referendum were of the impression that abortion was simply going to be limited to 12 weeks, and even so that is quite liberal. The Archbishop of Armagh said there are many GPs, doctors, nurses, midwives, pharmacists and others who felt that they wanted to “distance themselves as much as possible from the direct and intentional taking of the life of any unborn innocent defenceless child”. Meanwhile, Bishop Cullinan said one of his hopes for 2019 was “to see a Church where lay people realise their role much more fully and not to leave their Christianity in the church building but to live their Catholic Christian faith in the bits and pieces of every day, in the home, the factory, the office, the hospital, the school”. Dr Cullinan said he believed that now, more than ever, people in Ireland need to know that they are created by God, loved by God and that their lives have purpose in spite of difficulties and suffering.